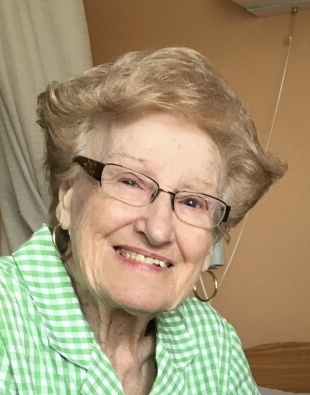 Sylvia R. (Leone) Protano, 97, of Milford, where she has lived her whole life, passed away Tuesday morning, Oct. 30th, at the Beaumont Skilled Nursing Center in Northbridge. She was the wife of the late Edward Montanari, who passed in WWII, and Anthony Protano, who passed in 1994. Born in Milford, she was the daughter of the late Giovanni and Josephine (Schiappa) Leone, and was a graduate of Milford High School, class of 1939. She had worked for many years as a secretary at the former Cushing Hospital in Framingham, and loved to spend time with her family, cook, dance, dress up, and order from QVC. Loving mother of Edward P. Montanari of Milford, Robert A. Protano and his wife Stephanie of Douglas, and Anthony B. Protano and his wife Melanie of Pelham, NH. She was predeceased by her daughter in law, Caroline Montanari, and granddaughter Pamela Jodrey. Sister of the late Blanche Rizoli, Mary Mancinelli, Constantine “Ben” Leone, Ann Bisiccia, and Albert Leone. She was the grandmother of Stephanie Montanari, Jason Protano, Jenna Protano, Tyler Protano, Katherine Protano, and Anthony Protano, and great-grandmother of Vincent R. Protano. A calling hour will be held at the Consigli-Ruggerio Funeral Home, 46 Water St., Milford on Monday, Nov. 5, 2018 from 8:30-9:30AM, followed by a Mass of Christian Burial at 10AM at the Sacred Heart of Jesus Church 7 East Main St. Burial will follow in the Parish cemetery. I have alway s admired Sylvias enthusiasm for life.Mary Goodwin, Tyler Goodwins other Grandmother . she lived a good long life.